*The $50.00 Double Minute Plan gives the user DOUBLE minutes for every pin purchased thereafter. 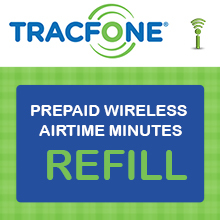 This plan will not expire unless the user's Tracfone becomes inactive. This plan may be transferred to a new Tracfone by calling Tracfone customer service at 1-800-867-7183. **The $129.99 refill is a DOUBLE MINUTE CARD which means that any airtime added in the next 12 months will automatically be doubled.